Wow! Outside of 2 days last weekend when I went to a Terry Trahan's Weaslecraft seminar that made me late with 2 daily pictures, I've been able to draw/post a picture a day. When I started this, I didn't think I would be consistent enough to produce a picture a day. Here we are at the half-way point of the month! The Guard position. Left arm free. Knife arm drawn back. Side view. Major portions of the body will not be extended into opponent's range. Keep your feet at about a 90 degree angle. The blade is drawn in, close to the body, and held in an unbroken line from your elbow to the point. Shoulders face the opponent squarely. Torso and head are held erect. 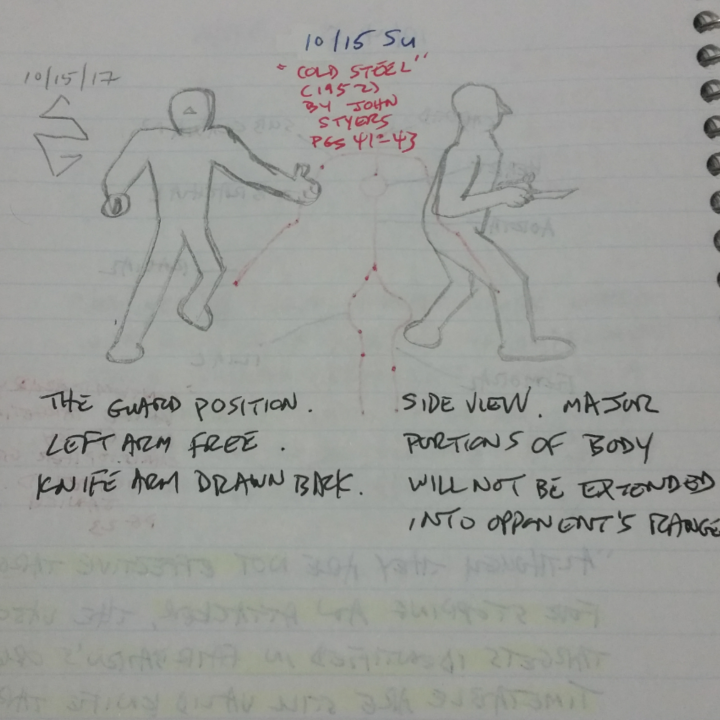 The arm on hip should swing free, but care must be taken to prevent it from extending beyond the hand which holds the knife. Your blade points directly at your opponent's throat. PRACTICE all the points of the proper stance until you can draw your blade on command of "On Guard!" and instantaneously snap into the perfect position without losing a second to make major adjustments. PRACTICE all of the points of the proper stance until you draw your blade on command of "On Guard!" and instantaneously snap into the perfect position without losing a second to make major adjustments. 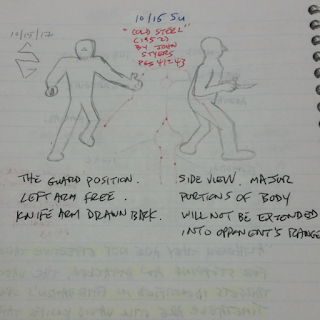 PRACTICE until ALL of the points in the ON GUARD position become coordinated into ONE natural movement. ALL OF THE ATTACKS AND DEFENSES OF THE SKILLED KNIFE FIGHTER ORIGINATE FROM THIS GUARD POSITION." Inktober Day #1 - Taiji's "Snake creeps down"
Inktober Day #5 - Bob Kasper's/Kni-Com's "Passata Sotto"
Inktober Day #9 - Michael Janich's/MBC's "The Filipino Grip"
Inktober Day #11- Trapping's "Pak Sao"
Inktober Day #17 - Bob Kasper's 5th Principle of Knifefighting - "Stay in the box." Inktober Day #18 - Dwight McLemore's/American Fighting Congress' "Window of Combat"
Inktober Day #19 - Beware the hidden knife! Slowly but surely I've implemented changes to the site's look and functionality. I'm sure you have noticed the changes. Ecstatic that I've finally been able to successfully update my site closer more in line with my vision of it. Not sure if it will be the final look of the site or not, but the Sojourn of Septillion Steps with respect to the site's look has already taken quite a few steps beyond the first! I will still be endeavoring to put up information I think will benefit your martial arts training as well as your self-defense. I sincerely thank you for visiting/reading! Copyright © 2006- Stickgrappler's Sojourn of Septillion Steps and Authors of the various articles I've reposted.